About Our Doves/The Five W's of UNITED DOVES L.L.C. From the beginning of time, doves have represented love, peace, purity, and fidelity. You may often hear the sweet sound of the doves cooing to each other. These birds are referred to many as White Doves, White Angels, White Doves of Angelic Presence, Holy Spirit Doves, White Flying Messengers of Peace, along with many more emotional expressions and associations. All of the United Doves are white doves, and all are important to us. We keep these doves vaccinated as to provide the best health for them as we possibly can. We also invest many hours of training and care to ensure the well-being of each dove. Please scroll down the page to learn more about our doves. For more information, please visit our FAQs page. 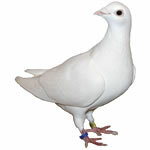 The doves we release are called Rock Doves, otherwise known as white racing homing pigeons. They can navigate home using magnetic fields. A great deal of scientific research has been done on this subject, and we now know that magnetite is found in the birds brains and their beaks. This magnetite helps them navigate home from many miles away. Throughout time, these doves have been used in wars to relay messages and thus have saved people's lives. Today they are most often used in the growing business of providing dove releases for special events. Fantail Doves are beautiful creatures, a fancier breed of doves used for display only. The doves received their name due to their tails, which fan out. These doves also have feathers on their feet. The Turtle Dove, also known as the Love Dove or White Ring Neck Dove, is smaller than the others. Also for display only, these doves have a calm and peaceful nature. The Five W’s of UNITED DOVES L.L.C. v WHO: United Doves L.L.C. 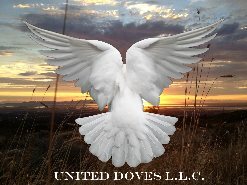 We are a professional and private White Dove Release Company with several franchised locations across the USA. All locations are privately owned and operated under our guidance we teach to our Franchisees. v WHAT: We have a combined experience of over 85 years in releasing Ceremonial White Doves which have flown for Weddings, Funerals, and other special occasions. We provide Professional White Dove Releases which create “An Inspirational Experience” for our Clients and Customers across the country. Over 15,500 Recorded White Dove Releases and counting…. and the birds are all trained to make it home safely to their loft after each release assignment. There is tremendous symbolism is releasing doves. 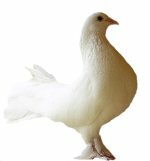 v WHEN: In 1989, Daniel Hash (Founder) began releasing his “RARE” (50) White Homing Pigeons flock on a regular basis in Utah for special events as requested. As business grew solely by word of mouth, he soon became the “Go to person” for others interested in getting started in this niche business for releasing White Doves. All birds that are released at our various locations are properly trained to fly year around during daylight hours. v WHERE: Headquartered now outside of Salt Lake City, Utah. We have multiple locations across the country and look forward to opening up many more locations as we move forward to expand the business efforts. The birds that are released at these various locations are all properly trained out to “Return Home” after being released. These can return home safely from hundreds of miles when trained to do so. v WHY: Our purpose is to fill a need which provides a beautiful service designed to bring comfort, peace, as well as inspiration to those who desire to incorporate White Doves into their ceremony or service. There are a lot of upcoming dove release companies getting started; however, it’s very important that one is able to distinguish the Professionals from the Hobbyist’s. This is a professional business we dress and operate in, and we absolutely love what we do!! Let us help create that special moment which will be cherished for years to come with the celebration of a White Dove Release. "We are a service-connected veteran-owned business." "All images copyright © by United Doves and original owners. All rights reserved. You may not upload any of this content found on our website, including images to any other websites, print publications or distribute it commercially or otherwise. It is illegal to use these images, content, and wording found on our website and to post on community websites or other personal websites for any purposes of gain whatsoever. We reserve the right to make any changes to the website as needed without prior notification.